Tonight can play out in two ways: the B’s rally their worn-out troops to overcome the Bolts in a victorious bounce back or…they lose in real ugly fashion. The narrative continues in Boston and it’s not a pretty one. Injuries have hit the team hard this season and while they’ve mustered some wins, things are starting to catch up. 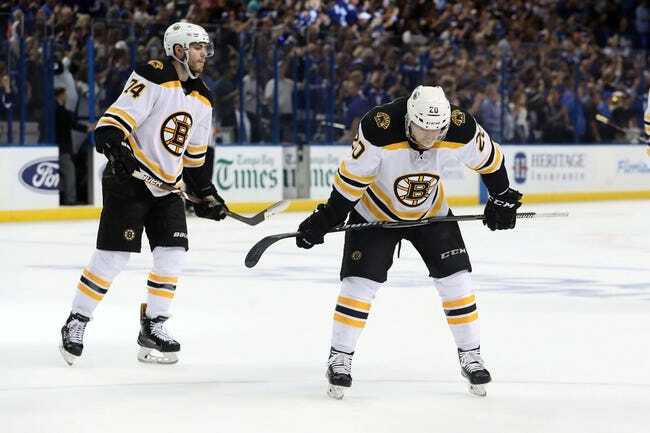 Tuesday’s abysmal loss to the Florida Panthers was a good example of just how much the Bruins are missing their key players defensively. But fret not Bruins fans-it’s still early in the season. The team will be healthy and McAvoy is thisclose to returning. As we know from last year when Boston wasn’t looking too hot early on (injuries galore) they became that “thorn on your side” type of team that ended up in the Stanley Cup Playoffs . Coming off back to back losses to Detroit and Florida, the Bruins have their work cut for them when they face a juggernaut team led by Nikita Kucherov, Steven Stamkos and Brayden Point. The Bolts return home to the Amalie Arena to face the Bruins after completing a perfect road trip, posting a 3-0-0 record. Tampa recently played games against the Florida Panthers, New Jersey Devils and the Detroit Red Wings. Monday night’s game against the Red Wings saw the Bolts rally back to win 6-5 in a shoot-out. Mathieu Joseph had two goals, while Cedric Paquette and forward J.T. Miller both recorded short-handed goals. Right-winger Nikita Kucherov leads the team with 42 points, while Brayden Point has 37 points. The 22-year-old Point leads the team with 20 goals while Kucherov has 12 goals with 30 assists. Center Steven Stamkos has 26 points with 10 goals and 16 assists. The Lightning are in first place in the Atlantic Division as well as the league, boasting a 21-7-1 record with 114 goals. One weakness that perhaps the B’s could expose; Tampa’s number one goalie, Andrei Vasilevskiy has been out with a foot injury. Louis Domingue has stepped in for goal-tending duties with a 11-4 record, 3.14 GAA with a .900 save percentage. Domingue is expected in net for tonight’s game against the B’s as goalie Eddie Pasquale played this past Monday. In a rematch from last’s season’s Stanley Cup semi-finals, the Bruins are looking a little different. Boston continues to muster through as they await the return of top center forward Patrice Bergeron, Captain Zdeno Chara, defensemen Charlie McAvoy and Kevan Miller. Brandon Carlo returned to the fold this past Saturday night as the B’s fell to Detroit 4-2. With the loss of Bergeron, the Bruins have held on to a 4-3-1 record, prior to Tuesday’s game. Wednesday’s practice saw a few line changes with the team focusing on breakouts and the power play. “We focused on breakout structure to get out of our end quicker. Pick up the pace of the game. That allows us to play fast. That leads to more attacks. We talked a bit about the power play groups, we knew that we needed to put in a good practice in at some point.”- Coach Bruce Cassidy.